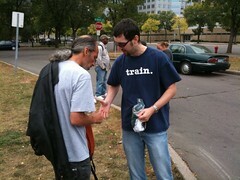 A couple weeks ago homeless advocate Mark Horvath came through the Twin Cities on his InvisiblePeople.tv road trip. I had the chance to hang out with Mark, see him in action and briefly join him in his work. We went to the Dorothy Day Center in downtown St. Paul (driving in the fancy Ford Escape Hybrid that Ford generously loaned Mark for the trip), handed out socks courtesy of Hanes and talked to homeless people. Mark tapped away on his iPhone, posting updates to Twitter, pictures to Posterous and recording video for InvisiblePeople.tv. It was a humbling experience, especially hearing their stories of facing one hardship too many and losing it all. Many of them had lost jobs and homes recently and were on the street thanks to the current recession. A homeless ministry was serving lunch while we were there and a number of people kept coming up and asking them for blankets and sleeping bags. Cold is coming in Minnesota. I really value Mark’s perspective on the homelessness issue because he’s been there before and understands it in a way many people don’t. He also understands the practical realities. Frankly, it’s devastating to walk out here and talk to people, knowing I have a cozy warm bed and home, plenty of blankets, sheets and even a spare room. Whatever I’m doing to help the homeless, there’s always more I could do. I realize inviting a stranger into my house isn’t always practical (nor approved by my wife), but tell that to the person sleeping on the sidewalk. I don’t know how Mark has traveled the country doing this. He always talks about it wrecking him, and now I can understand why. A few people asked me for money and I had to say no. I could empty my bank account handing out cash, but who knows what good it would do. I took great comfort in the garbage bag of brand new Hanes socks we were handing out. The very least I could do was hand out socks and listen. Mark called me one of his heroes, but I don’t get that. He’s the hero. He’s the one practically homeless himself, living on the ragged edge without a real job or steady income trying to tell the stories of the homeless. On Tuesday night my wife and I took Mark out to dinner. It was my wife’s birthday and we’d gotten a babysitter so we could have some actual conversation with Mark. When the check came I got totally schooled in the credit card draw. Mark had grabbed the bill and slapped down his card before I could even react. Even the waitress was impressed. I tried to protest but it was too late. Mark insisted and paid for our dinner, including dessert. That’s the kind of guy he is. He’s the hero. 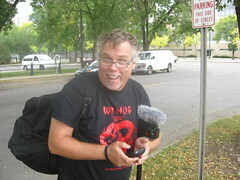 Check out InvisiblePeople.tv and watch the stories of homeless people. Hear them. See them. Open your eyes and your heart. If you want to know more about helping the homeless, Mark suggested this resource, 10 actions you can take to end homelessness. If you want to support Mark and the work of InvisiblePeople.tv, you can make a tax deductible donation online. I’ve been subscribed to invisiblepeople.tv for a while, bummer I missed this. Great stories, great blog post.